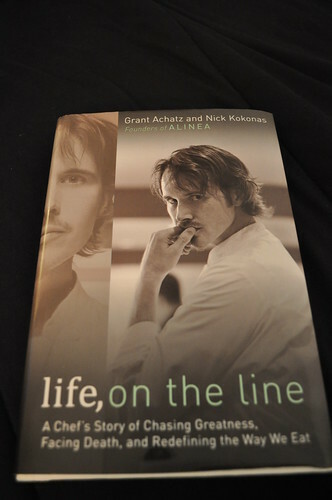 When I heard that Chef Grant Achatz's co-written (with his business partner and long-time friend, Nick Kokonas) memoir, Life, on the Line: A Chef's Story of Chasing Greatness, Facing Death, and Redefining the Way We Eat, would be released in March 2011, my book-signing urges resurfaced. I knew he and Mr. Kokonas would have to go on some kind of book tour of sorts to promote it, and New York City would undoubtedly be one of the stops, being it is one of the culinary capitals of the world (or so my wishful thinking has always led me to believe). I tried Googling for some answers, and I pored over their publisher's dedicated website to see where they'd be touring. I saw that they'd be doing a few things in Chicago on opening day and that they'd be doing some kind of luncheon at the James Beard House to promote the book. I tried to jump on that, but predictably, the event was sold out before I could score a seat! I thought all was lost until I stumbled upon this (what-seemed-to-be-unpublicized) talk hosted by the New York Public Library (NYPL) featuring a discussion with Chef Achatz and Mr. Kokonas about the new memoir. 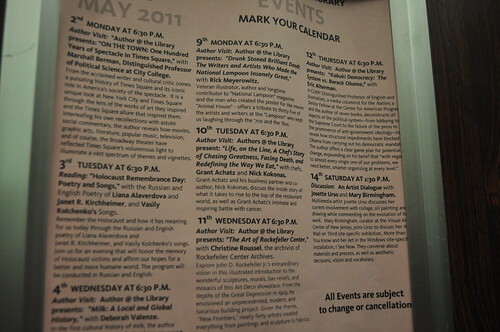 Plus, the event was free to the public--a lovely bonus! At the time, it was two months out, but this hardly stopped me from penciling it into my upcoming culinary agenda. 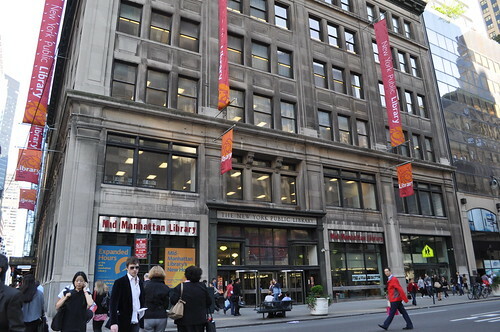 After a slight mix-up of thinking "Mid-Manhattan Library" was in fact the iconic "NYPL," one of the library clerks kindly directed us to the correct location on Fifth Avenue at 40th Street. Fortunately, Marcus and I were forty-five minutes early, so that gave us ample time to find the correct location. When I checked the NYPL website this morning, I noticed that Mr. Kokonas was no longer included in the event's description. It appeared that Alina Munoz, co-founder of Culintro, a restaurant organization based in New York, would be moderating the interview with Chef Achatz. Although I was disappointed that I wouldn't get to meet Mr. Kokonas, Ms. Munoz asked very interesting questions that kept the audience engaged, which I really appreciated. Prior to co-founding Culintro, she used to work for Gourmet magazine as an account manager, where "she developed numerous contacts within the restaurant industry culminating in an interest to unify the culinary and design communities." Ms. Munoz began the interview by introducing herself and her friendship with Chef Achatz (i.e., she is one of his girlfriend's very close friends), diving right into the questions shortly after. 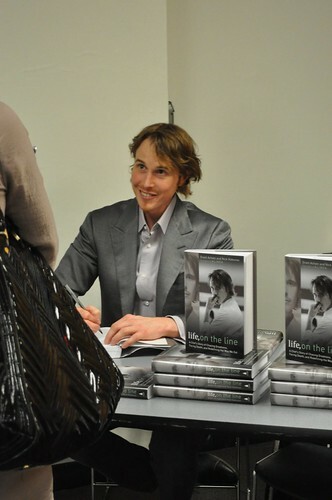 In response to Ms. Munoz's question about when he developed the idea to write this memoir, Chef Achatz said that he has always been honest and open with the media. As such, he felt that he had an obligation to "get on the soap box" and be his own advocate, especially with respect to his unusual experience with cancer. His first, second, third, and fourth medical opinions yielded the same results--strongly advising him to remove his tongue, where he was diagnosed with stage IV squamous cell carcinoma. It wasn't until he consulted doctors at University of Chicago that suggested an alternative route, which was, at the time, in clinical trial stages. This alternative route was what allowed him to beat and survive the cancer and the resulting nightmare of possibly losing his tongue and sense of taste completely, emphasizing to him how important it is to spread the word about his personal experience in order to possibly help those who may be in similar situations. Ms. Munoz broached the subject about how Chef Achatz had to learn how to taste again after his cancer went into remission, asking him how this affected his relationships, especially the ones he had in his kitchen. First, Chef Achatz responded by saying how there is a strict hierarchy in any professional kitchen--that the executive chef is the guy, the "final stamp of approval"--i.e., the final palate for tasting before anything leaves the kitchen to be served in the dining room. That being said, there was a total role reversal when he began radiation treatment. Now, the mentor must look to his protégés, where Chef Achatz had to place total trust and belief in his staff to know when something was perfect enough to serve to Alinea's patrons. They knew their goal was not to let down Chef Achatz--they rose to the challenge to keep Alinea running at its highest caliber. Second, Chef Achatz mentioned how he didn't realize how important the sense of taste really was in the culinary world and with food. He finally realized that eating and tasting equated to pleasure, and when he could no longer enjoy that pleasure, it was shocking. It was very apparent in his loss of taste. When asked about his mentor, Chef Thomas Keller, Chef Achatz shared an anecdote about his invitation to try out at The French Laundry (TFL). He was about 21-22 years old when he stepped into the kitchen of TFL and saw two men--one handling produce and the other mopping the floor. Che Achatz asked, "I'm looking for the Chef." To his total surprise, the man handling produce simply said, "He's right over there," meaning the guy mopping the floor. From this anecdote, Chef Achatz emphasized the importance for mentors to lead by example, as Chef Keller would do everything he could to make TFL the best (even a menial task like mopping the kitchen's floors). More on Chef Keller as his mentor: Chef Achatz also mentioned the intimate party that Chef Keller threw for him at Per Se to celebrate him being named one of the 100 Most Influential People in the World by Time magazine. While he was encouraged to invite everyone he wanted to this shindig, it was the menu that Chef Keller created for the party that resonated with Chef Achatz--he couldn't have created a more perfect menu. It was tailored for Chef Achatz's likes and dislikes as a person while it simultaneously accommodated the remaining radiation effects on his tongue and throat. Chef Achatz was so stunned that he even asked his girlfriend, Heather Sperling, Chicago editor of TastingTable, whether she had spoken to Chef Keller, where she denies any discussion about the menu with Chef Keller. Chef Achatz said that it is Chef Keller's generosity, passion, and attention to details and individuals that make him the best mentor. When asked about how creativity began in the kitchen, Chef Achatz simply referred to the kitchen at Trio, the restaurant where he was Executive Chef and where he began exploring his modern cuisine. It was small and not at all ideal, but it was what they had to work with, leading him to say that problems start creativity (as with the Trio kitchen). While there is indeed a problem at hand, Chef Achatz said that in his case, it created a sense of spirit with the band of seven cooks that he had with him at Trio. Chef Achatz mentioned when David Shaw, Pulitzer Prize-winning writer and the chairman of the James Beard restaurant committee (unbeknownst to him at the time), dined at Trio. After his dinner at Trio, he wrote an article addressing how it seemed that the chefs at Trio were working with not only executing the technical aspects of a meal, but the emotional aspect as well. Mr. Shaw definitely understood the mission Trio was trying to accomplish, and it gave the restaurant a tremendous amount of strength and confidence in what they were doing and where they were headed. Ms. Munoz then proceeded to ask Chef Achatz about the portion of subtitle of the memoir's title that read, "Redefining the Way We Eat," and how at Alinea, diners are transported through senses. Chef Achatz simply answered that food and dining now equates to an art, when it formerly used to be solely a craft--the redefinition referred to in the memoir's subtitle is doing just that: that gastronomy can be an art. When asked about the impact of press (both good and bad--particularly in reference to Ruth Reichl formerly of Gourmet and John Mariani of Esquire magazine), Chef Achatz said he realizes the importance of media with the food industry and business in general--ultimately, awareness is a critical component to any chef's career and business. He said he feels that Alinea's genre of food (whatever that may be) needs explanation, and the press is a way for them to communicate it to the public. He also added that the accolades and media, in the most genuine way possible, give the restaurant, its chefs, and its staff a pat on the back to recognize what they're doing is good and on the right track. What the challenging part is maintaining the level of caliber that the press is communicating and the accolades are declaring. When asked about Next and Aviary, Chef Achatz's latest culinary projects, he discussed how there were initially talks of globally cloning Alinea and how this would only be, in all honesty, to make more money. But from a creative perspective, he added, the cloning of Alinea does not work--Mr. Kokonas concluded that this would ultimately lead to competition with Chicago (i.e., better than the original, not as good as the original, or same as original), resulting in a lose-lose-lose situation. With that being said, they will not create another Alinea. As Alinea's focus is "constant innovation," Chef Achatz felt that the "next" compelling idea, creatively speaking, would be "constant exploration." This exploration would entail menu changes (as expected) but with two added twists--the "geography" of the menu (i.e., cuisine type) and the "time" of the menu (i.e., past/present/future date, era, etc.). This is what encompasses Next restaurant, where a "new" restaurant is "open" every three months, requiring lots of research and development, documentation, new serviceware, etc. Aviary, on the other hand, will explore the rise in cocktail culture today and how to modernize this with roots in the "classics." Ms. Munoz went on to talk about travel and how it impacts Next's project choices. Chef Achatz went on to say how it is one thing to read about food in books, especially cookbooks, where ideas/instructions are conveyed in a certain way, but takes away from the connections with the people who cook and prepare the food at hand, which informs another level of understanding of said culture. Ultimately with travel, the engulfing environment is a part of the culinary and gastronomic experience. The serviceware at Alinea is all custom-designed by Martin Kastner, whom Chef Achatz refers to as Alinea's "secret weapon." During Chef Achatz's time at Trio, he found it odd to be serving "modern cuisine" on conventional serviceware. Many times, as strange as it sounds, it wasn't practical to do so. So Chef Achatz began to look for all types of designers, finding about forty on Google, e-mailing all of them describing what he ultimately needed. Surely enough, only one responded (and you'll never guess who! ), and they've been collaborating ever since 2002. Mr. Kastner fuses functionality with aesthetics (ultimately what Chef Achatz calls "edible sculpture") while incorporating the emotional aspect of dining as well. With the creative pieces brought to light by Mr. Kastner, Alinea and Chef Achatz's new projects break the monotony that stem from traditional serviceware. Mr. Kastner likes to ask thought-provoking questions like, "Why do cocktails need to be served in glasses?" to get the creative juices running. On the importance of aroma: Chef Achatz stressed the importance of aroma not only in cooking but especially in life. He refers to two types of aromas, the first being aroma that projects flavor and the second being aroma that projects emotion/memories. Scent memory is more powerful than sight memory with respect to emotions, as it can instantly transport you back into time, to a memory, to an emotion. Che Achatz briefly touched upon the natural lifecycle of a chef (i.e., cook > chef > restaurateur) and how it usually comes in waves of 15-20 years, changing based on society's interests and generations. While food television shows promote gastronomy (with intentions being good) and its overall awareness, the popular culture of celebrity chefs may mislead young culinarians into thinking that the life of culinary arts is all fame and fortune, when that doesn't happen as often as perceived. Alinea pays attention to the physiology of the diners by checking in mid-way through to make sure patrons are not overly stuffed or are still hungry for more than is scheduled in a said tasting menu. Important rule in cooking: when you think you've added enough salt, double it! When reading/using Alinea's cookbook, be sure to read Mr. Kokonas' how-to-use-this-book introduction. Chef Achatz encourages its users and readers to be aggressive when trying to execute recipes, but also to be creative, too. Readers must remember that Alinea has a kitchen of a little over a dozen chefs executing all of these dishes to perfection, so taking parts of recipes and finding a creative way to serve it at home may be the best way to use the cookbook at an individual level. Why do we truss chickens? Because of tradition. The overhead of Next restaurant will not change (staff, etc.) The interior will remain the same for the most part--they didn't want to become Epcot Center. When looking for new cooks, Chef Achatz looks for passion, respect at all levels, good personality, and a favorable attitude. Chef Achatz signing books at the end of the interview. My copy of Life, on the Line. 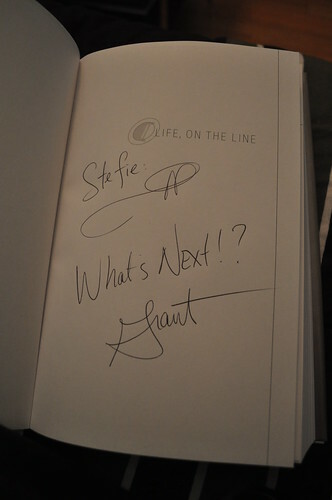 Here's my signed copy of Life, on the Line! Findings: I found Chef Achatz to be really well-spoken and engaging as featured guest interviewee. His thoughts were well-organized and easy to understand, and his incorporation of anecdotes to answer questions worked very well, too. It was so great to finally meet Chef Achatz in person (as he was unable to leave the kitchen during my visit to Alinea but still graciously signed my menu)--so refreshing to put a voice to the memoir that I read a couple months ago. Chef Achatz seems really easy to talk to--not pretentious at all, just straight to the point. He even made a disclaimer at the beginning that Ms. Munoz was going to ask him some questions, and he would try to the best of his ability to answer as honestly as possible. Ms. Munoz was very organized in keeping the interview going and asked many interesting questions that the audience was happy to listen about. If you ever have the opportunity to see him speak, I highly recommend you go see him! Price point: free event, $27.50 for each book.